Elkin Shop Will Be Opening Mid -`April! Finally, we are reopening our second location in Elkin, North Carolina at 222 East Main Street in the newly renovated Liberty. The first photograph shows the front of the building. You can enter into the shop in the double doors and we are on the right. You may also enter from the outside door which is just below the orange and white barrel awaiting paint. 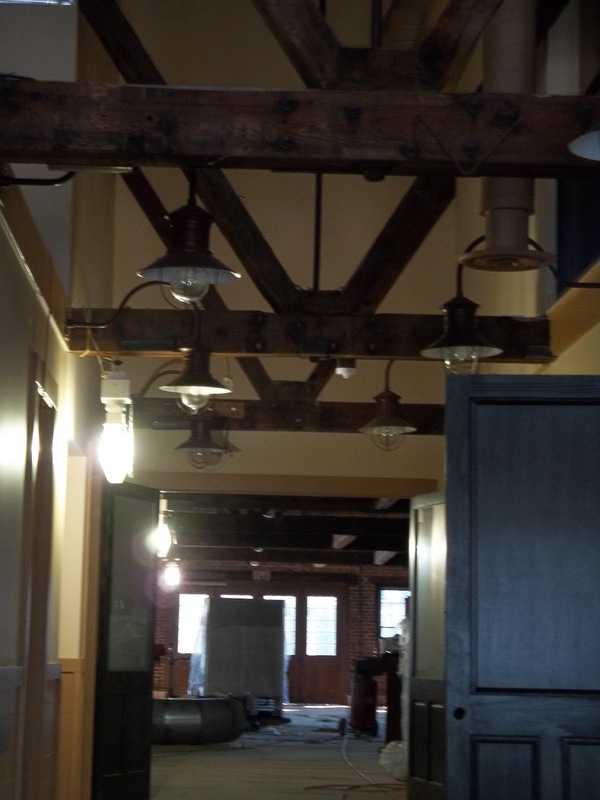 The second photo is the view when you walk though the front double doors, although still under construction in the photo, it is pretty amazing! We are offering our Vera Bradley Hipsters and Mini Hipstesr at a special price (while supplies last and in-stock items)! 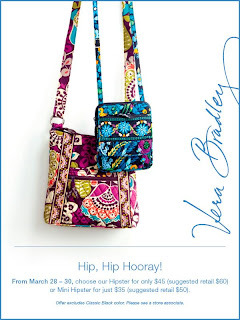 These two great bags make a summer adventure easy by freeing your hands with their ...easy crossbody strap. These magnetic butterflies would be a perfect decoration for an Easter Basket and only $3.99! 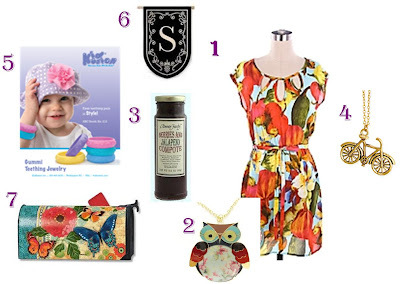 A Quick Snap Shot of Lots of New Arrivals! 1. We just received 6 new styles of spring dresses (sizes S, M & L). This is only one of the great designs. 2. New colorful owl necklace only $15.99 3. Great new Berries and Jalapeno Compote that can be used in many ways, especially tasty with baked brie. 4. Bicycles are becoming a very popular graphic in clothing and art. We now have this cute necklace. 5. Gummy Teething Bracelet that Mommy can wear on her wrist to easily keep track of a necessity! 6. New monogram garden flags! 7. We just received two shipments are new Mail Wraps designs as well as Yard Design signs. 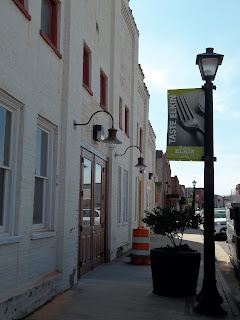 As always please call us with any questions at 336-667-4556! 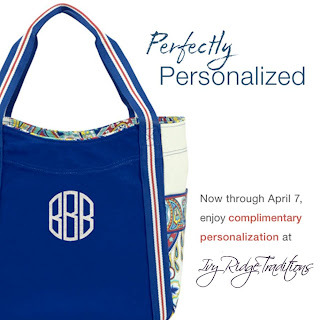 Personalization is now available on certain Vera Bradley styles. We order these through Vera Bradley with a monogramming fee. Don't worry about the fee! 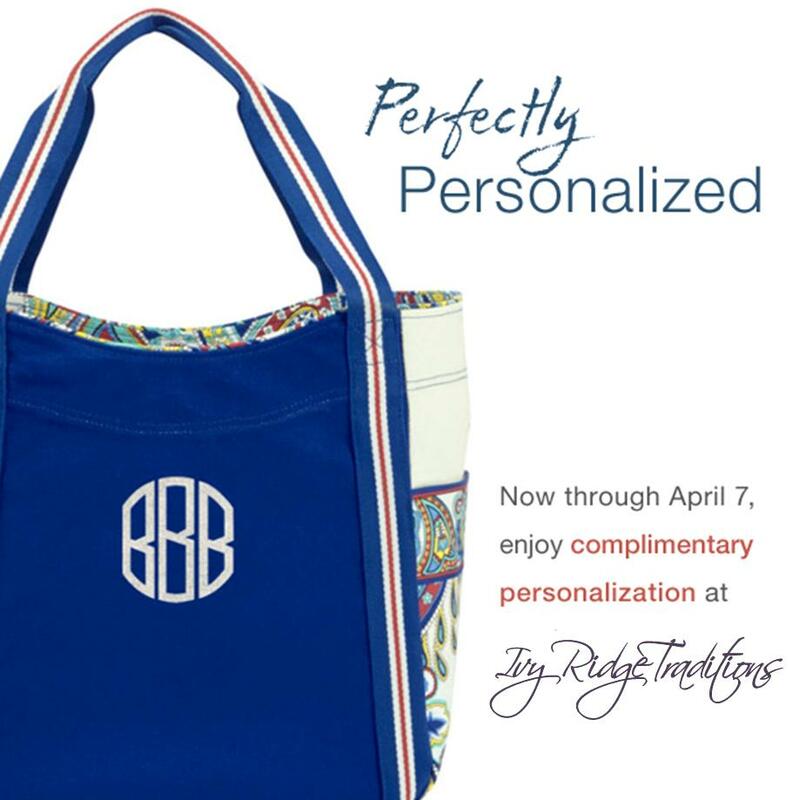 We are going to pay the monogramming fee for you now through Apri 7th! 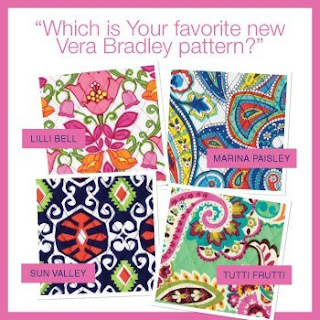 Four New Vera Bradley Colors Just Arrived! Happening Through Monday, March 25th! 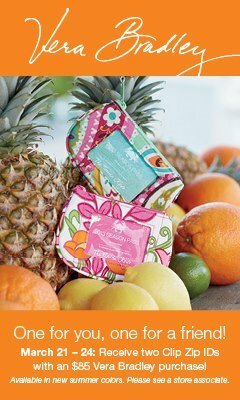 Beginning Thursday, March 21st through Monday, March 25th (we are continuing through Monday, March 25th, because we are closed on Sunday), receive TWO CLIP ID CASES when you purchase make a Vera Bradley purchase of $85.00 or more (excluding sale items). One to keep and one to give! Pandora's Free Bracelet with Purchase is Back! It is Pandora Free Bracelet with a $100 or More Purchase ! Purchase $100 in Pandora jewelry and receive a FREE Pandora Snap Bracelet ($65.00 retail)! Thursday, March 21st - Monday, March 25th (Closed Sunday, limit one per customer).